If you're a teacher, and want to keep your job, don't insult your students on Facebook. If your boss is a Jewish community leader, and you want to keep your job, don't post photos on Facebook of yourself covered in swastikas. And if you're anyone who wants to keep your job, don't go on Facebook and insult a police officer. 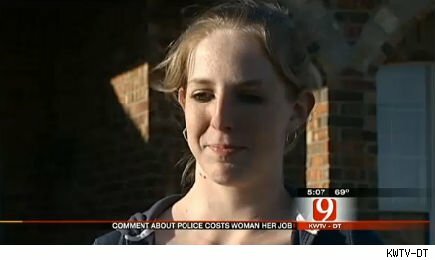 Warden's Facebook post quickly went viral on law enforcement sites, reported Oklahoma City TV station KWTV, and Chili's was barraged with calls demanding that she be fired. Chili's agreed. "With the changing world of digital and social media, Chili's has Social Media Guidelines in place, asking our team members to always be respectful of our guests and to use proper judgement when discussing actions in the work place ...," the restaurant chain said in a statement. "After looking into the matter, we have taken action to prevent this from happening again." "Involvement in the local community is something Chili's prides ourselves on," the statement added, "and we are proud to partner with local law enforcement officials in our more than 1,200 restaurants throughout the U.S."